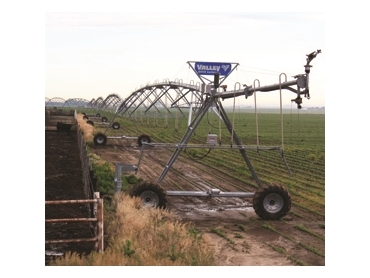 Valmont Irrigation, a manufacturer of mechanised irrigation systems has released the new Bender30 option for centre pivots. The Valley Bender30 pivot option increases the number of hectares a grower can irrigate. Designed to bend any drive unit up to a 30-degree angle, a grower can easily avoid obstacles in the field such as trees and fences allowing for maximum irrigated hectares. Joel Bergman from Loomis, Nebraska, USA was able to acquire additional hectares next to his cattle yard using the Bender30 pivot option that allowed him to bend his 7-span Valley centre pivot at the third regular drive unit to irrigate a large section of unused land. No structural changes are required to be made to the machine to fit the Valley Bender30 pivot options as they easily retrofit into existing centre pivots. The Bender30 can even bend at multiple locations on one centre pivot. Valmont Irrigation also provides a speed-up timer function on the Bender30 that improves the centre pivot’s water application while in the bent position ensuring precision irrigation.